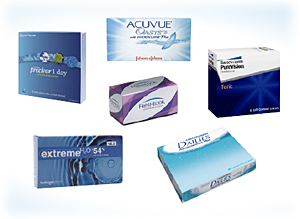 Click here to order your contact lenses online! Contact lens technology is always evolving, and now nearly anyone can wear contact lenses as a part-time or full-time alternative to glasses. Dr. Dan, Dr. Diane, Dr. Monica and Dr. Kayla specialize in fitting all types of contact lenses including daily disposable soft lenses, extended wear lenses and rigid gas-permeable lenses. These can correct for astigmatism, near-sightedness, far-sightedness or even all of the above at the same time!